The New MT5: Is It Worth Trading? As you probably know, the industry is slowly but steadily shifting towards MT5. In my opinion, MT5 is the future of retail trading. Let's find out what special about this new, revamped platform! This is just a small list of every cool feature the new MT5 has. It is very hard to write about it all as the list is very long. Have a look at the webinar we did about the cool new features of MT5! Why Is MT5 a Better Choice? One of the major benefits of the MT5 platform is that traders are not restricted to using only the built-in analytical resources, such as MT5 tables, indicators, and graphs. Owing to MQL5, an object-oriented language and a high-performance programming language, traders are able to create their own technical indicators. The coding should be much simpler than MQ4, so that traders can even create trading robots, or Expert Advisors (EA). Trading robots (EAs) are able to automatically implement different trading strategies based on a number of different inputs. That way, traders will have the ability to access very accurate market analysis and forecasts. Starting with the Beta Build 1281, MT5 allowed hedging that was only possible with MT4. Unlike the standard netting system, hedging allows to conduct multiple trades even in the opposite direction of the same symbol. Now, traders can use the netting model to trade exchange instruments and hedging for currency trading using the MetaTrader 5 institutional platform. However, MetaTrader 5 offers enhanced order management capabilities, e.g, filling orders using multiple deals, including partial fills. If a trader has an open position at a symbol and performs a new deal, a new position is opened. 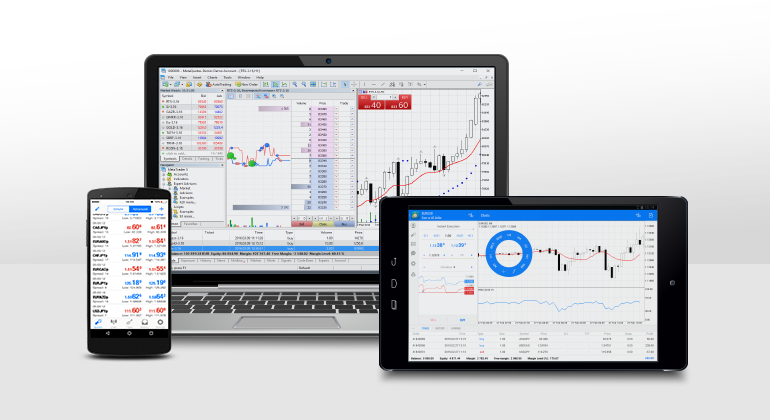 That is the core idea behind the MetaTrader 5 hedging system. The trader can set Stop Loss and Take Profit levels, as well as see the profit level for each of the positions. In my opinion, this was an absolute must for all who traded using different hedging strategies. However, MetaTrader 5 offers enhanced order management capabilities: filling orders using multiple deals, including partial fills. If a trader has an open position at a symbol and performs a new deal, a new position is opened. That is the core idea behind the MetaTrader 5 hedging system. The trader can set the stop-loss and take-profit levels as well as see the profit level for each of the positions. MT5 allows to get real volume traded data, not only tick volume data. The tick volume means the number of price changes that have occurred in the course of the bar and nothing more than that. With MT4, you simply do not know the real volume (contracts, or lots) that have been traded. In MT5, you can download and consult tick history from your broker. In MT4, you can only save tick data manually, which brings about many limitations. You must have your platform turned on 24 hours a day, and still… you'll never keep all the ticks. In MT4, you can never know what was the most traded price or cluster in the selected range. You have to make an estimation using only M1 bars which is a drawback compared to the real tick history of the broker, especially if you do the backtesting. Why is this important? Simply because there are many traders who use tools like Market Profile, Delta Volume, and other tools, i.e., real POC/VWAP/Profile levels. A few of my personal favourites include easy Ladder Trading and expanded Mini Terminal available through MT5SE. These tools are very important to scalpers and news traders as you can do trading with in just a few clicks. This tool allows for an unpreceded accuracy in opening and managing positions quickly. Traders are able to open both pending and market orders with the use of a new order ladder. The risk and reward for orders will be calculated on the fly, and super easy for you to set up, believe me. For example, to open a pending buy order, you can simply click on the blue ladder at the requested price, move the mouse up for take-profit and down for stop-loss, and to open a market order, just hold the SHIFT button on your keyboard and hover your mouse on the ladder. Easy, right? With new MT5SE, you are able to expand the Mini Terminal into a fully-featured control panel for your whole account with a simple click of a button. That way, you should be able to open and manage orders more easily as well as receive important information about your selected trading symbol. As mentioned above it is very hard to count all the advantages of the MT5 platform, so please take your time to have a look at the video below! MT5 is faster than MT4. It doesn't slow up your platform and so far, I haven't noticed any hiccups or freezes. It is a fully fledged 64-bit, multi-threaded platform, whilst MT4 is a 32-bit, mono-threaded platform with a 2GB (or 4GB memory limit if you use it on a 64-bit operating system). In my experience, I have seen the speed increase of almost 100 times when I did the backtesting. The industry is advancing, evolving, and moving towards MT5. According to Anthony Papaevagorou, Head of Sales at MetaQuotes, as saying at the Finance Magnates London Summit, the focus has been fully shifted to MT5.